Again Day 4 began with an energising & jam packed class led by Andrea Masala & it was lovely to see yet more new faces attending our open classes. We then spent the morning revising some contact based movement material taking into consideration some of the feedback we have recieved throughout the process. In the afternoon we began to fine tune the movement material already explored and added deeper meaning and dynamic layers to each of the movements. Everyone is looking forward to the ‘Sharing’ on Saturday 4th September at 4.00pm in Studio 1 at Dance City, which everyone is welcome to come along to. More details to follow very very soon…………. Today started with an energetic Cunningham class which soon got the bodies warm and the blood pumping. It was really great to see so many people turn up for class today and everyone seemed to enjoy it. Time in the studio has been a little challenging for the dancers, but they have stepped up to the mark and produced some great quality work. Martin Hylton very kindly came in for some support and gave some really useful feedback and directions which has definitely been taken on board. Martin will be spending more time in the studio with us tomorrow…..it’s going to be tough but we are looking forward to it. Oscar Watson, Director of Intercultural Arts , visited us in the studio for a preview and chat with Andrea and the dancers. He was thrill and excited by the developments and work produced so far and is really keen to attend the ‘Sharing’ at 4.00pm on Saturday 4th September in Studio 1 at Dance City. More pictures, some videos and information about the people involved is to follow very soon…..so watch this space…..
We hope you had a great Bank holiday weekend, we certainly did and had some well deserved rest. Anyway, back to work now and time for some reflection on days one and two of Week 2 of Shardana’s R&D period. On Tuesday we moved from the Dance Lab at Dance City to the more ‘luminous’ Studio one. Day one started with a lovely Cunningham based technique class led by Andrea Masala and it was great to see few new faces in class. After an evaluation of the first week of our time in the Lab, watching some video footage of the work achieved so far, we discussed new issues and ideas to explore and experiment with. The first task and exploration was centered around the topic of religion within individual cultures and our personal prospective. Andrea asked these questions:- How do we live and practice religion in everyday life? How easy it is to maintain our beliefs in today society? Do we actually believe in something? Mmmmm! That was a tough one…….. We chatted quite a lot about it and shared our points of view on this subject matter. Although most of us don’t really practice, attend religious services or necessarily believe in the ‘BIG MAN ABOVE’. We all agreed that in one way or another, through our parents or cultural heritage, we had plenty of knowledge and opinions about the subject matter. All of these elements consequently inspired motifs and movement material. A “sketch” evolved: maybe because were in touch with our spirituality, self-reflection or maybe because it was the beginning of the week or the early hours…… ;o) The material generated resulted to be very meditative and sensitive in dynamic and intention, which contrasted with the movement vocabulary generated in the first week. This opened new and interesting avenues for exploration and an awareness and understanding of human interaction. Another good day at the office! On day two we revised and added to the new material devised the previous day. We worked towards refining new qualities and timings required, for a correct and appropriate execution of the new material. We all found it quite difficult to adapt to this new movement vocabulary. We wanted to further understand the deeper meaning and intention at the centre of the work undertaken, nevertheless, we are still very positive and excited about the outcome of this task. We are all looking forward to seeing what tomorrow is going to bring. Day 4 brought about time for reflection after an exciting, physically demanding and adrenelin pumping class led by Kate ‘Zamira’ Mummery. 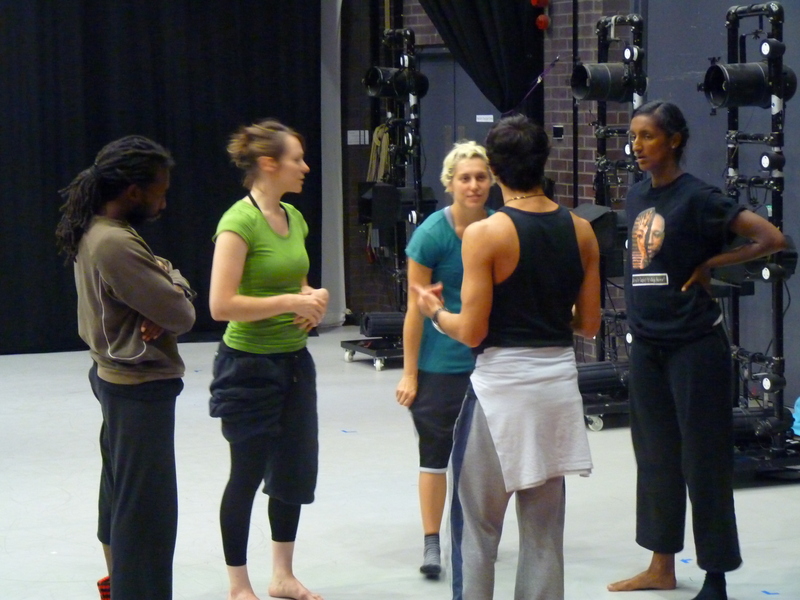 The dancers took time to recap all movement to date – revisiting the underlying themes and intention behind where the movement came from whilst Andrea Masala and Peter Waters took time to learn more about the dancers’ individual background and experience of the Dance Lab process so far. These informal reflections and peer feedback/observations helped to consolidate the movement and the meaning behind it – resulting in a fab run of the movement to date at the end of the day. Day 5 began with a fusion of Cunningham/Graham technique and floorwork led by Andrea Masala. An exciting day included technical support from Dance City. A recurring theme that has arisen from various discussions throughout the week has been the notion of putting people into boxes. This inspired a geometric design for the lighting that helped to accentuate choreographic suggestions of the ‘relay race’ within life/society as well as confinement, restriction and a desire for freedom. It also heightened the contemporary abstracton of each of these themes. Day 5 resulted in linking together the movement from the week’s workshops and devised ‘sections’ into what has begun to feel like a trailer for a potential full length work. Each section of the choreographic trailer has vast room for research, exploration and development and audience feedback suggests the trailer leaves them hoping for more. At the end of the first week we have opened a plethora of ideas, avenues for exploration next week and indeed movement material to play with. We leave you with positive vibes and with plenty to absorb, rehearse and reflect upon over the Bank holiday weekend – We are going to relax, chill out, hit the sauna and we’ll catch you on Tuesday. Don’t forget – pop in, ask us questions and join us in Dance City (studio 1) for daily professional classes all next week from Tuesday to Saturday at 9am – 10.30am. After a very physical and thought provoking two days we’re grabbing this chance to fill you in with our latest news, developments and discoveries from Lab Space. Both days started with excellent open professional class that set positive and creative vibes for the day; Graham/Cunningham class was delivered by Martin Hylton on Tuesday and Andrea Masala’s dynamic Cunningham class today. Feel free to join us for free class all this week from 9.00 – 10.30am in Dance City’s ‘Dance Lab’, Newcastle Upon Tyne (next week classes will run Tues until Sat in Studio 1). The past two days brought about discussions concerning the word ‘culture’ & what it actually means. Culture and interaction within society does not necessarily stop at race, religion and ethnic origins but is intrinsic to many elements of society. The more we explore and discuss elements of our own cultural differences and indeed the topic of cultural difference in Britain today, the broader our research and exploration becomes. Our challenge at present is translating some of these thoughts, findings and feelings into a movement language and considering how to present them in a way that perhaps avoids, or rather questions and challenges the need for stereotypical imagery to portray our own particular backgrounds. Nevertheless, we are becoming increasingly excited to continue this exploration and are looking forward to the twists and turns that the movement material being created, via various tasks and experiments, will take each day. Pop in and have a look at our creative process – ask us questions, share your thoughts or just come and meet us all. Class tomorrow will be a physical and cardio based session looking at the use of rebound and ‘getting in and out’ of the floor led by Kate Zamira Mummery. To sum it up: A very productive two days; stiff & smelling of tiger balm we bid you bon nuit! Well, it’s finally underway; the dancers have met, muscle rub is on the go & the creative juices are certainly flowing! A great first day that kicked off with a lovely & challenging class delivered by Martin Hylton; bit of a shock to the system but thoroughly enjoyable! Far too tired to say anymore! Excuse us while we crawl off to bed!! Stay posted for daily updates, pics and vids throughout the week….